About.com Genealogy is the highest-ranked single contributor genealogy site on the internet. Kimberly Powell, the curator, does a terrific job keeping it up-to-date with the latest news and tips as well as detailed and valuable lessons and how-to articles. If you aren’t already familiar with this resource, you owe it to yourself to check it out. 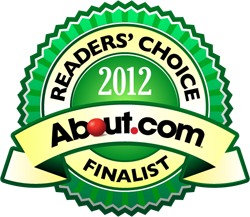 The site is currently hosting the “2013 About Genealogy Readers’ Choice Awards“. Readers have nominated their favorites and the finalists have now been chosen in eleven categories, ranging from genealogy software and apps, to websites and blogs. This is a great chance to let the genealogy community know which products and services are most valuable to you. Just click on the above links to vote. Don’t forget, you can vote once per day in each category. Voting is open through midnight (EST) on Tuesday, March 19, 2013. Winners will be announced on March 27, 2013. Great Family tree software program. Like the new features in Roots Magic 6.
rootsmagic is a wonderful genealogy appl. RM6 allows you to record and track a large amount and variety of ancestor information. I just love Roots Magic. It’s features have re-vitalised my interest in researching my geneology. I love doing it again. I really enjoy my Roots Magic program. You have done a great service to all of us as users. Thank you for the continuous updates. You are doing a great job. I have loved Rootsmagic since Family Origins stopped. Now that I can also use it on my Mac through Crossover, it’s even more wonderful for me. It’s easy to share information, easy to figure out relationships. And most of all, very easy to learn. Great all round. Thank you for RM6, I just love it. Don’t know how I ever managed without it. Finally cleaning up 20 yrs of confusing data from other programs. Great genealogy program. I have tried most of them and love this one. Great features and easy to use. For ease of use, and intuitive connections, there is nothing better than RM — in almost any version. Absolutely the best on the market… and the price is good, too. The beauty of RootsMagic is in its simplicity to use. I really enjoy Roots Magic and just upgraded to Roots Magic 6 so I can get histories added as well. It’s so easy to use. It makes me excited to do geneology again. It also has made me work harder to scan documents and pictures so they won’t be lost. I recently signed up for Roots Magic so I have not really tried it very much. I hope it will help me keep track of several ancestral lines. I love Roots Magic, I recommend it to all my friends for ease of use. I’ve used several other programs over the years but no other compares. Not much I could say here that I have not been saying since I started with RM3. Amazing program, does everything I ever wanted in Family History software and more. Absolutely the finest on the market. I have used Roots Magic from the days of Family Origins before windows. It has always been software of which there is no equal. I have tried others, but always kept my Roots Magic. I love working with RootsMagic. It does everything I want and so much more that I didn’t know I wanted. Thanks for a great program! The best family tree program on the market. I tried to document my electronic family history records since PAF v1 was available for my Commodore 128 with the CP/M module. It was brutal. Family Origins was light years ahead. When Roots Magic came into existance the documentation process became doable. I love the ease with which documentation can be entered and the variety of ways information can be connected to your ancestors in Roots Magic 6. It is wonderful to be able to include links to the original documents and pull them up with the click of the mouse. I enjoy using roots magic as it helps me compare my information with what others have on family tree. RootsMagic is the best genealogy program out there, especially for beginners. This is the best genealogy program that I have used. Of the two others that I used, one did not keep up with the times and the other was just to convoluted to use. A BIG plus for RootsMagic is the ease of emailing the whole tree or portions of the tree to fellow family members or researchers. Keep up the good work. Roots Magic has always been the best and it only gets better. Programe for novices and expert alike. We have used Roots Magic since Family Origins. It has been very helpful in tracking our family. Roots Magic is a great genealogy program. Thank you for your good work that shows in the continuing improvement of each issue. I have been using it since Family Origins. Just downloaded RM6. Haven’t used it yet, but expect to enjoy the new version, with its added features. I’ve tried them all but have to say Rootsmagic is my favourite. I have used RootsMagic and its predecessor, Family Origins, successfully since 1991 and recommend it exclusively to anyone interested in genealogical research. With over 40,000 people in my database, I laud its ease of use adaptabilty to meet the needs of a variety of family situations. Plus, it is constantly updated and upgraded through software development. Kudos to RootsMagic!!! I have used RootsMagic and its predecessor, Family Origins, successfully since 1991 and recommend it exclusively to anyone interested in genealogical research. With over 40,000 people in my database, I laud its ease of use and adaptabilty to meet the needs of a variety of family situations. Plus, it is constantly updated and upgraded through software development. Kudos to RootsMagic!! !